From the famed Blitz Facial Bar in downtown Toronto and Brooklyn, NY comes their skincare line, Body Blitz. The spa is a great place to get anything done that involves making improvements upon yourself. I live an hour an a half away from Toronto, I shall have to give the place a go. 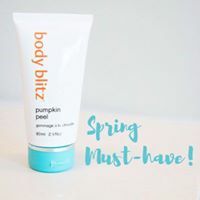 This Pumpkin Peel is an enzymatic blend of pumpkin pulp and carrot extract with papain and bromelain enzymes mixed together for a healthy, refined appearance. After cleansing skin, apply a thin layer over face avoiding eye area. Leave on for 10-15 minutes then rinse thoroughly with warm water. This mask leaves skin feeling soft, clean, amazing and absolutely brand spanking new again. All the dead skin cells have been taken away, eaten up by the enzymes and all that is left is brand new pinkish beautiful skin. And your skin is so, so soft. As soft as a baby's bottom. Don't you want skin like that? I certainly do. The mask smells like pumpkin pie. Seriously. It smells good enough to eat. I would not eat it but boy does it smell delicious. It actually has cinnamon and nutmeg oils in it, which is what would give it that pumpkin pie smell. The mask has a good number of natural ingredients in it that are good for the skin. Ingredients that take off dead skin cells, nourish the skin, replace moisture, help exfoliate the skin, help to fight against free radicals and to replenish hydration. When you are done with the mask your skin does not feel dry, nor does it feel scratchy or itchy like some enzyme masks make your skin feel. It feels soft, hydrated and moisturized and well off. This mask is definitely a winter and a spring must have. I think it is a must have for all year around honestly. It is such a good mask that I would recommend using it at least once a week. And you don't need that much either. Just a little bit does the job. One tube should last a few months. This product is available through Blitz Facial Bar in Toronto or Brooklyn. Their website is www.blitzfacialbar.com. Like Blitz Facial Bar on Facebook: https://www.facebook.com/blitzfacialbar; Follow Blitz Facial Bar on Twitter:@blitzfacialbar and Follow Blitz Facial Bart on Instagram:https://www.instagram.com/blitzfacialbar/.